May 24, 2001 in Hackensack, NJ. Common Problems Take Common Solutions. The roof is leaking, but it doesn't just leak for you--it leaks for all the tenants in your building. When the furnace breaks down, everyone at your address is without heat. Problems like these can only be solved by organizaing the tenants in your building. Bringing everyone together builds a strong community of action and support. With the guidance you get from New Jersey Tenants Organization, you will learn how you and your fellow tenants can stand up to that landlord and get repairs made. The first step is to organize! Stop Eviction. Do you know how to stop an eviction? Your unique situation calls for a specific solution. Contact the NJTO and tell us your story. We're experienced and we know what to do. But do us a favor, don't wait. Many problems can be avoided by immediate action. Waiting only gives your landlord the advantage and could leave you on the street. Learn your rights as a tenant. Contact us. Landlord politicians want to create eviction legislation that would eliminate the 3 day waiting period for Warrant of Removal. This practically denies tenants their right to due porcess. Getting Repairs Made is probably the biggest problem facing a tenant. Many tenants wonder if they will need to get an attorney just to get a toilet fixed. Or can you do it yourself and deduct it from the rent? NJTO can help you figure out what to do. Contact us with your specific situation and we can give you advice. An Ongoing Issue: Fight Rent "Unit Decontrol" in New Jersey. Vacancy decontrol is a method for landlords to undermine and eventually eliminate local rent control. It means an unlimited rent increase when an apartment becomes vacant. Under vacancy decontrol, landlords get tremendous monetary benefits from turnover of tenants and they do whatever it takes to convince tenants to move out, including harassment and lowered maintenance. Over time, vacancy decontrol means the end of rent control and the elimination of affordable housing. We must fight to stop unit decontrol. On the State level, Michael Patrick Carroll (R-25) had introduced a bill in the New Jersey General Assembly which would establish and enforce permanent vacancy decontrol in every local rent control law in the state. So far, the NJTO has been successful in stopping it from becoming law. Make sure your representatives know you want to maintain Rent Control. No time to help out? Make a donation to NJTO. Make your check out to "NJTO"
--Give us back our Tenant Property Tax Rebate! --Stop Rent-Gouging and excess rent increases! --Give back to Tenants their Security Deposit money! Individual dues are $25.00 per year per apartment. Send your check to our mailing address listed above. Make check out to: New Jersey Tenants Organization. 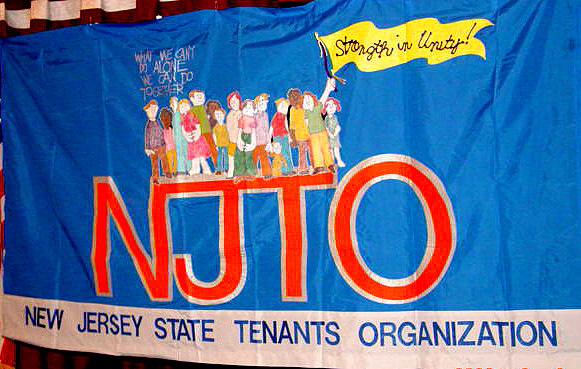 Click for updated link to New Jersey Tenants Organization (NJTO). to mail with your check. FREE E-BOOK: Mystery of Quercus Gardens. the heat is gone from Beth and Bob's apartment, now what do they do? Tenant organizing could solve their problems, but what about the murder of Mrs. Mary Gilligan? CLICK HERE.